Compared to other investors, business owners require a different approach because they have different wealth management needs. Much of your wealth is likely locked up inside your company. And yet one day, you will want to reach financial freedom. We specialize in advising business owners on how to build their personal portfolios and invest outside of their companies, both prior to and then after they exit. Discover the areas of planning you need to address to create the potential to reach and maintain financial freedom post-exit. You require a different approach to investing and wealth management because you are different. You built your business and your wealth differently. How do we maintain the income that we receive from my company after I exit? How do we avoid running out of money at any point after exit? 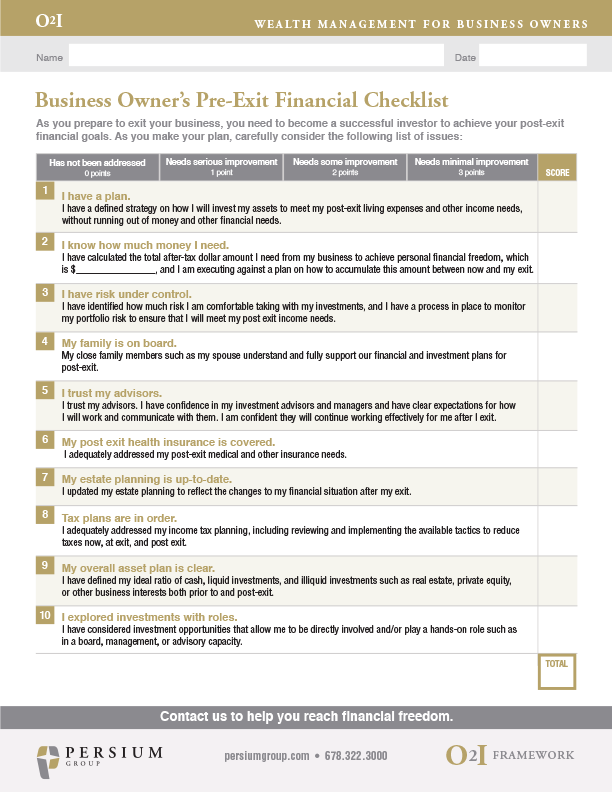 How much do we need to extract from my business exit to fund our financial goals? How do we address our living expenses that are currently paid for by my company? How do we handle issues such as benefits and insurance after I exit? How do we select appropriate investments? How do we manage risk in our investment portfolio? How do we know if our investment advisor is doing a good job? How do we invest tax-efficiently? We work with business owner investors to help them address these issues and plot a path to financial freedom. We created the Owner to Investor (O2I) Framework to address the specific needs and concerns many business owners face when investing outside their companies. 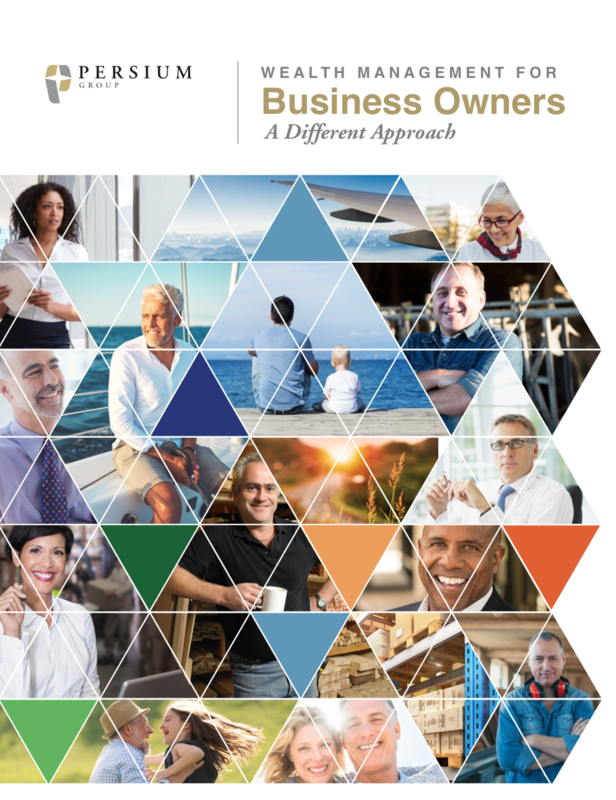 The entire framework centers around you, the business owner, and illustrates the specific practices that we follow to address the needs and realities related to owning a business. In this manner, we help our clients stay on the right path to financial freedom. When you have a trusted advisor helping you navigate big decisions and are no longer stressed about money, you are free to focus on the things that really matter to you. Learn how to successfully transition from business owner to investor and overcome the challenges business owners face when pursuing financial freedom. Through a program called NAVIX®, we help guide business owners towards successful exits. Find your Risk Number and get your FREE Portfolio Risk Analysis! Assess your risk tolerance to ensure that your portfolio aligns with your investment goals and expectations. Persium Group consists of three teams: Persium Advisors — wealth management for business owners and other investors, NAVIX — exit planning for business owners, and CoVerity — serving the needs of retirement plan committees. The Persium Group, formerly known as White Horse, is an independently owned and operated firm that was founded in 2004. In 2010, White Horse Advisors, LLC registered with the Securities and Exchange Commission as an investment adviser allowing us to operate in a product neutral, fee-only investment environment. At Persium Group, we offer three distinct lines of business. Persium Advisors, LLC is an SEC registered investment adviser offering traditional investment advisory and asset management services. CoVerity™ is a brand name through which we provide investment advice and consulting services to sponsors of qualified retirement plans. Through NAVIX®, we provide exit planning services to owners of closely held businesses. Persium Advisors, LLC and its affiliates do not provide tax or legal advice. Clients are urged to consult their tax or legal advisors to understand the tax and legal ramifications of any actions or investments recommended by Persium.